The United States has made progress in recognizing that high-capacity broadband infrastructure is a critical and necessary component of a community's economic well-being and quality of life. Much still remains to be done, however, to turn this recognition into the reality of smart and connected communities across the nation. Local governments everywhere want their communities to have affordable access to robust broadband infrastructure, just as local governments a century ago wanted their communities to have affordable access to reliable electric power. Then, with the private sector unable to electrify America everywhere at the same time, more than 3300 communities stepped forward to develop their own public power systems. Those that did generally survived and thrived, while many that waited for the private sector to get around to them did not. Now, a growing number of communities believe that history is repeating itself in the broadband area, that if their businesses and residents are to succeed in an increasingly competitive information-based global economy, they must again take their futures into their own hands. Not surprisingly, as the private power companies did a century ago, several communications companies have sought to erect a wide range of legal, political, financial, and other barriers to the ability of communities to serve their own needs. This is true even in some rural areas that do not offer enough economic incentives for private investment. So, what should guide local governments as they navigate these highly complicated waters of high-capacity broadband? 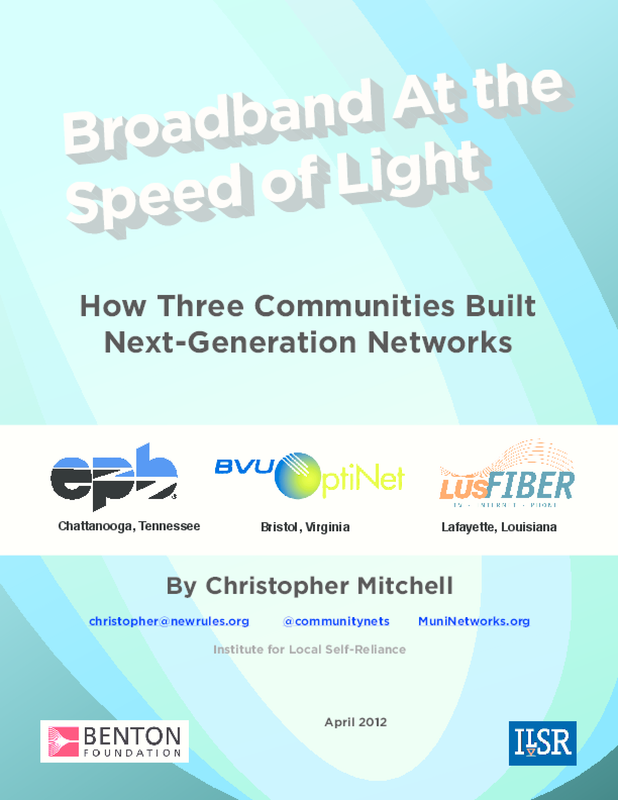 This report details the experiences of three municipalities that have gained attention around the world for successfully designing and implementing public broadband networks -- Bristol, Virginia; Lafayette, Louisiana; and Chattanooga, Tennessee. Each has faced significant challenges in its quests to bring 21st century communications technology and its benefits to its community. Each has met these challenges and is now providing its community multiple benefits that would not have been achievable any other way.